Board games are a great source of family fun and making memories. We’ve been collecting board games for 20 years now, and our collection changes over time as we sell or give away ones we’ve outgrown (or no longer enjoy) and buy new ones. Having a regular family game night, or even a family game day (where you play all day!) is a great tradition you can start with your own family. Don’t let games bust your entertainment budget, though! 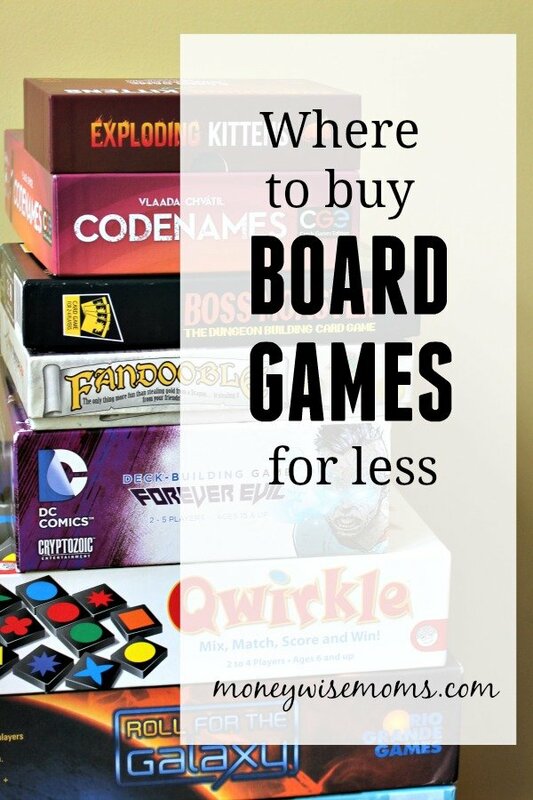 Here are some stragies for saving on games, with my tips on where to buy board games for less. We’ve found some real gems at local yard sales, some of our favorite games, actually! Obviously, you’re taking a chance that some pieces may be missing, but often you can open the game to take a look at the condition and ask the seller how it plays. One of the up sides to yard sales is they’re the lowest prices among used items. You know I love a good kid consignment sale, like the ones Mothers of Multiples clubs hold each year. These sales are great opportunities to find games for preschoolers and young kids, and you’ll often find outgrown games from real gaming families like mine. Just as with yard sales, you my get lucky and find some gems, but at a thrift store, it’s harder to see if a game is complete and in good condition. My experience here in the DC area is that some thrift stores have high prices because of overhead. I’ve mentioned before that Neighborhood Facebook Groups have become the new Craigslist for me. You get great items at great prices and don’t have to drive all over town. Often, you’re not even dealing with strangers (another plus). When you see board games posted, ask questions about how the game plays for different-aged kids and try to bargain. We’ve traded for months at a time with other families that we know play a lot of games and have different ones than we do. And occasionally, we’ll just outright trade for keeps. It’s a great way to increase the size of your game repertoire without paying any money. Another place that gamers sell used games is online at Ebay. If you’re looking for an out-of-print game from years ago, you can usually find it there. Keep an eye on the price, though; sometimes prices go too high to make it worth the purchase. I’ve had good luck over the years selling single older games there to the wider audience than I would locally. I feel bad saying this, but when you’re on a budget, it’s really hard to shop local and support independent stores. We do buy games at our favorite local comics & gaming store when they have promotions, especially at the holidays. But prices tend to be lower on Amazon which is why I link to them when I write my game reviews. Obviously their selection is larger as well. When we first started gaming right out of college and were on a tight budget, it was really hard to justify spending $40 on a single board game. But once we had the game 5-10 years and played it regularly, I really saw the value. I also recoup some of our costs by reselling games at yard sales, kids consignment sales, and on Ebay. I hope you’ll include family gaming at your house! Where have you bought board games for less?